Check out this infographic! This is right in line with Costa Farms' O2 For You Program, which touts the benefits of indoor plants. 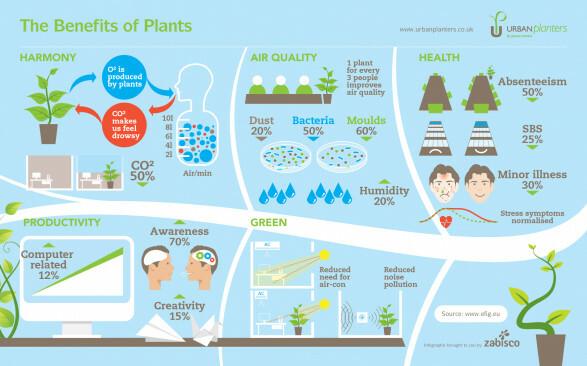 Plants make us happy, healthy and even more productive! NASA research has proven that specific varieties of indoor plants remove VOCs, Volatile Organic Compounds, from the air around them. As a result studies conducted by NASA and later by the Associated Landscape Contractors of America (ALCA) and Wolverton Environmental Services, Inc., proved not only the ability of indoor plants to clean the air but also proved which plants are more effective for specific toxins. Read more about the benefits of plants here.